From its seemingly mild side effects (bad breath, tooth discoloration, buildup of plaque and tartar), to the more sinister (increased risk of oral cancer, loss of bone within the jaw, gum disease and any number of resulting complications) – tobacco is indeed an oral health risk. Tobacco can cause serious health issues by breaking down the attachment of bone and soft tissue to your teeth. Because of this breakdown, the use of tobacco makes smokers much more susceptible to infection and diseases. 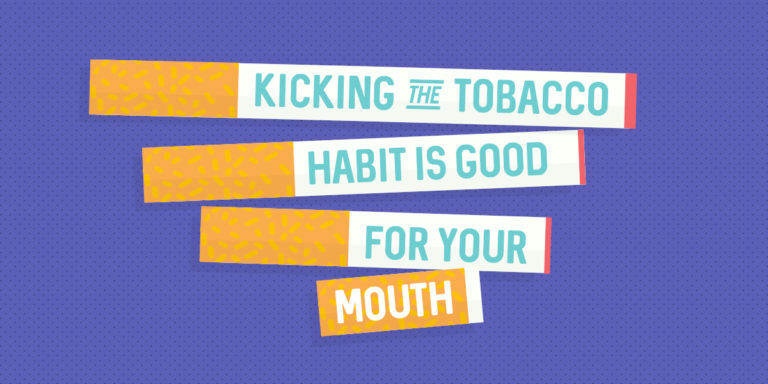 In fact, 90% of people who have cancer of the mouth, throat, or gums admit to using tobacco in some form. Cigarettes, cigars, and pipes aren’t the only culprits; smokeless tobacco can be just as detrimental to oral health, if not worse. In fact, there are twenty-eight chemicals found in chewing tobacco alone that are proven to increase the risk of cancer in the mouth, throat, and esophagus. Chewing tobacco and snuff contain higher levels of nicotine than those found in cigarettes and other tobacco products, making it exposes the roots, and ultimately makes teeth more susceptible to decay. The only way to help eliminate these risks is to never start using tobacco products or to quit if you do. In fact, simply reducing tobacco use is proven to help lower your risks. If you feel that it is time to reduce your risk of cancer, gum disease, infection and other oral complications, your dentist or doctor can help you create a plan to help you quit using tobacco, along with prescribing certain medicines or programs to help you kick the habit. Remember, it is never too late to quit. If you’re interested in getting help to quit, let us know the next time you’re in for an appointment. Call Dr. Nichole Martin today to make an appointment at (425) 774-5596.